I have just got back from a WONDERFUL family vacation at Singapore. My mother loved it. That is my favourite snap from the vacation. 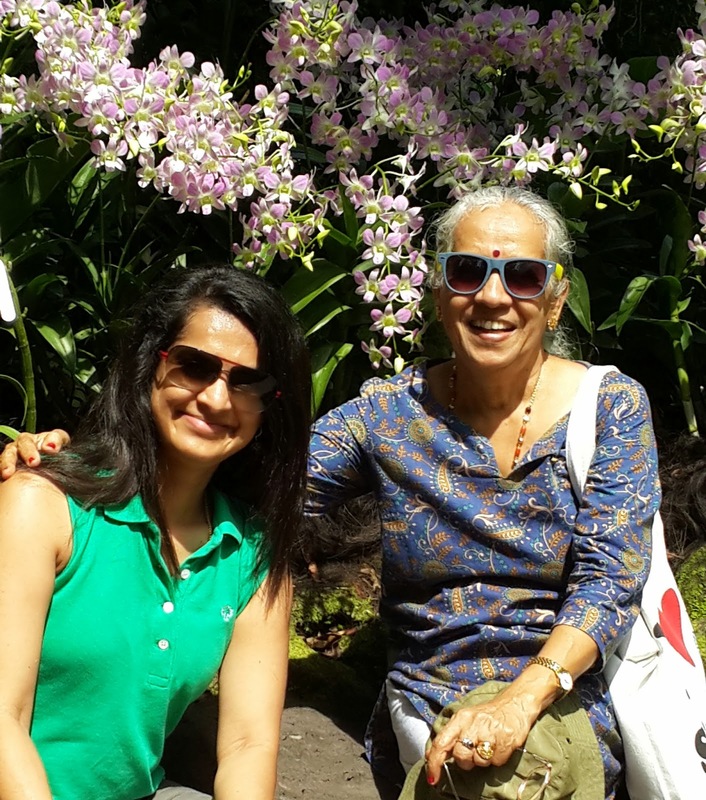 Clicked at Orchid Garden, where my mom transformed into a little girl, seeing the orchids in full bloom. I think she is more beautiful than the orchids that she admired. I haven't forgotten that the results of TOUCH Thursday no.4 had to be announced. It is just that I managed to touch base with Westland (my publishers) only yesterday. Congratulations! 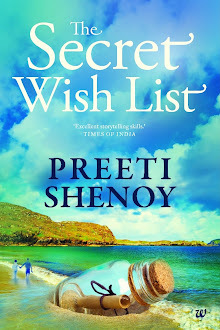 (please mail me your postal address on ps(at)preetishenoy(dot)com and Westland will send you the TOUCH mug. This morning when I was walking my dog, a lady who had moved in recently into a house at the end of the lane started chatting with me. "Are you working?" she asked. "I am a writer," I replied. "What do you write about?" was her next question. "I write novels," I said. "Oh, writers are creative folks aren't they?" she continued. "I guess", I said and smiled. She wanted to know the names of my books and I told her to google my name and she would get all details. I find it tiresome to explain to people what I write about. I find it easier to talk to you all, through my blog. Reminds me of the quote from the movie Indie Game. "It's why a writer writes---because they can. It's the most effective way they can express themselves." One of my resolutions for the new year is to write more in this blog. I will try and post more often, than I do now. What has been happening in your lives? Any exciting plans for hols? Any resolutions? What is the thing that you want to change about yourself? Thought about it? And may the festive season bring tonnes of happiness to you! ps: We set up a Christmas tree even though we do not celebrate Christmas, because I had a lovely tree and it seemed such a shame to do nothing. My mother and my kids decorated it. And I think it looks fabulous! Will post a pic sometime. Well thanks for sharing it. This was due for a long while. Just saw your tweet which redirected here and after reading this blog, finally I'm posting some thoughts about 'The One You Cannot Have'. I finished this book and had to let myself sit and think about it before writing this review, mainly because it stirred up so many emotions in me that I had to wait for them to settle before I could approach this. From the first page, the story draws you in and locks your mind on the feeling that everything is driven by a great sentiment. From an enjoyment standpoint, this book creates everything you could desire for entertainment, intense thoughts and all around literary excitement. If you wonder what it might be like to live in such a relationship that started so promising and needs so much work this book is for you. Insightful, thought provoking and powerful this is a must read. A huge part of my enjoyment of this novel was not being able to tell whether this couple were going to stay together or not. The author kept me guessing right up to the end. Indeed worth reading. Thank you so much. Waiting for the next one. All the best. Nyways read your novcel and as always its really toching. 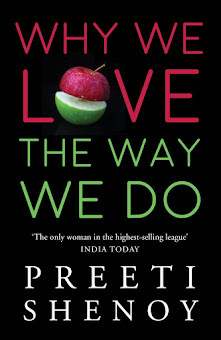 I felt too much connected with this novel. I cant express in words my feelings about this novel. Cant reveal too much on this public space but surely can tell you that it helped me to move on in my life. Thanks a lotttttt for such a lovely novel. Hope to see you soon in Mumbai. and its a delightful pic.. Regards to ur mom. MANY MANY HAPPY RETURNS OF THE DAY. MAY GOD BLESS YOU WITH WHATEVER YOU WISH FOR. Wish I could send an e-card! Any creativity attracts attention and so will your Christmas tree,when you have done it with heart and soul. Both of you look so happy.She must be feeling so proud of you! Wishing you, Satish and the kids a wonderful holiday season and a most happy New Year! A book launch and a note from Singapore.